Sadie Aileen Bouck of Royal Court Riverview, NB passed away at The Moncton Hospital on Tuesday, April 09, 2019 at the age of 94. Born in Montreal, PQ she was the daughter of the late Ernest J and Eva (Pittman) Burrows. 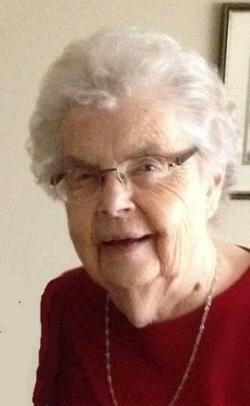 Sadie was a member of St. Paul's United Church Riverview. A life member of St. Paul's UCW and a former member of the New Brunswick Crafts Council. In her younger years, she enjoyed dancing, curling, crafts, music, reading clubs and travel. She will be remembered for her quick wit and fine sense of humour. Survived by son, Donald Guy Bouck (Heather) of Saint John, NB; grandchildren, Dylan and Kayli; special daughter, Brenda Bouck and her family Larry Williams, Joshua and Emilie; sister, Helena Brophey of Toronto; brother Ernest G. Burrows of Quebec as well as nieces and nephews across Canada. In addition to her parents she was predeceased by her husband, Guy S. Bouck; brother, Roy Pittman Burrows; sisters, Mae Carruthers and Marion Raven. A celebration of Sadie's life will be held at Tuttle Brothers & Riverview Funeral Home 214 Pine Glen Rd, Riverview, NB on Monday, April 15, 2019 from 2pm until 4pm. A time of remembrance and sharing will be held at 2:30pm. Interment will be in Alderwood Cemetery. The family would like to thank the staff at Royal Court Riverview, her physician, Dr. Jennifer Robertson, along with the doctors and the compassionate staff of the 5200 unit who cared for her during her stay at the Moncton Hospital. In lieu of flowers, donations may be made to St. Paul’s United Church, the Heart and Stoke Foundation, the Juvenile Diabetes Foundation, the Canadian Red Cross or to the charity of the donor's choice.